Father Mixed Sleeping Pills In 17-Yr Daughter’s Milk & Then Raped Her. Where Is The World Heading? We are shouting at the top of our voices, demanding security and safety for women whenever they step outside home. But the most shocking fact is that girls are not even safe in their own houses among their family members. An unfortunate incident has taken place in Bhopur Village near Bulandshahr, UP, in which a father has ashamed the relation of father-daughter. As per the Police Circle Officer Syana Anvita Upadhyay, a 17-yr old girl was raped by her own father when her mother went to meet her relatives. 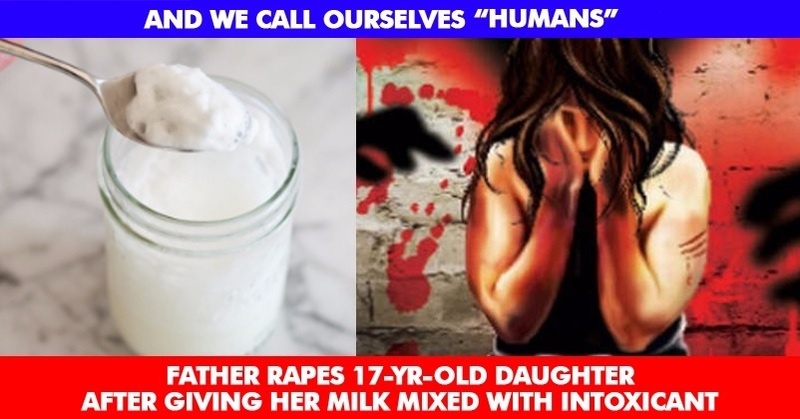 The incident happened on Wednesday and as per the girl, her father made her drink milk in which he had mixed intoxicated substance. The accused has been taken into custody by the police after they registered a complaint against him. What’s more, cops have also started an investigation into the matter. There is a need to bring a tougher law for such cases as it should inflict fear among those family members who are even thinking of committing such act. What do you say?